joy magnetism: Awareness. Not just a ribbon. Not just PR. You'd think that since I'm in communications, that I'd totally be jaded by all these PR awareness programs. And I am. Even so, I can never stop myself from being swayed by most awareness campaigns. It's too important not to be swayed in some way, shape or form. To wit: There's a habit that I picked up from a former colleague whose mother is a breast cancer survivor. I tend to pick up little things pink. Put a pink ribbon on it, put them at the check-out counters. I'm there. It starts with Papermate's Write for Hope pens and the Unite to Fight pens from Staples checkout. And continues with the Pepperidge Farm Milanos with their Inspiration for the Cure pink packaging, sitting on my dining table at home. And the half dozen pink-lidded Save Lids to Save Lives Yoplaits in my fridge. And of course, this magnet. Oh, there's more. But, really. It's only October 9. Early days, yet. Are these awareness campaigns just corporate social responsibility efforts? Absolutely, yes. Should we do this all year round and not just for special months? If budgets can support it, yes. Do they make a difference in purchasing decisions? For me, apparently, yes. Does they raise awareness and make a difference for the charities? Unequivocally, yes. So, in honor of awareness, and hopefully making a difference, just a few more efforts on my cancer awareness radar listed below. Avon Walk for Breast Cancer in NY is this weekend. Our company's participating in the Light the Night Walk in NY on October 15th. @earlyshowdave hitched a ride on his (successful, but looked exhausting) No Way Home with a man trying to raise money in memory of his mother, through the Susan G. Komen/Denver chapter. And finally, giving my David Tennant the last word, he is also helping raise awareness through the AICR's The Last Word campaign. I know I'm missing a ton, and I know I'm concentrating only on a few cancers, and I know there are more charities out there to support. Feel free to post them in the comments. is this your cause, then? did you ever see that sports night episode where josh charles' character can't decide what charity to give to because he feels like if he gives to one, he's shunning another. very good episode. i feel the same way. 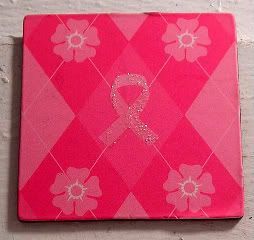 No, I wouldn't say it's my cause, per se, but I had the magnet, and it's October, and I like buying pink stuff. And, also b/c cancer runs pretty deep in our family history. I should have mentioned I also buy Dawn not just because it's what we grew up with and it's great, but also because it's what they use when to clean the animals when there's an oil spill, and they have a sea lion pup on their label to prove it. But, I agree, it always feel like you're shunning one for the other when you start to think of where to put your heart and dough.